Notch says that there are 'No current plans' for Minecraft on Wii U. Earlier in the week, some rumors cropped up on Nintendo Enthusiast that a version of Minecraft was in development for Nintendo's Wii U. The website has a pretty good track record for rumors, and it kind of makes sense to have Minecraft on the Wii U, but, unfortunately, Minecraft creator Notch has taken to Twitter to squash the rumor. 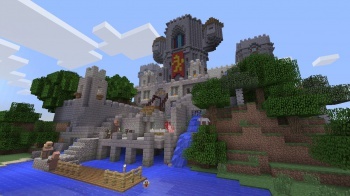 "I am not aware of any plans to release a Wii U version of Minecraft," Tweeted the developer. He later admitted through a second Tweet that he agrees a Wii U version would make sense, adding that "the only reason for no current plans is we've got too much work already. I <3 Nintendo." So, Nintendo fans, don't hold your breath, but you can probably go ahead and keep your fingers crossed. The original Nintendo Enthusiast rumor, which reportedly comes from a high-level insider source at a prominent retailer, said that a Wii U version of the game would make extensive use of the system's gamepad. Minecraft Lead Designer Jens Bergensten previously commented in March that a Wii U version of the game was "very unlikely." By the end of 2014, Minecraft will be available on PC, Mac, Linux, iOS, Android, Raspberry Pi, Xbox 360, and soon on PS3, PS4, Vita, and Xbox One.